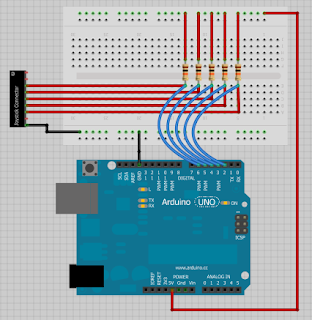 The Arduino "button" example uses pull-down resistors, but after awhile i realized that approach wasn't going to work. This joystick switches to ground, meaning that any voltage going to say the Fire button will "dissapear" when the button is pressed. Same for each of the directions too, because this is a "digital" joystick, they're all just buttons inside the joystick. So the answer is to measure what's going *into* the joystick, not what's coming out. For each of the joystick pins we send 5v into the joystick, and monitor that voltage. If there's 5v going in, then nothing has happened. But if that suddenly drops to near nothing, then a button has been pressed. Figure 1: Current limiting resistors. Returns output of Atari 2600 9 pin joystick to Arduino serial console.